Let’s get to work! Zoom into learning fun with the Vtech Toot Toot Drivers pack of Construction Vehicles. Pack includes the cement mixer, dumper truck and bulldozer, each with their own fun phrases and realistic sound effects, push the toot toot vehicles along and press the light-up face button to trigger 3 sing-along songs and lots of fun melodies. Encourages motor skill development and imaginative play. 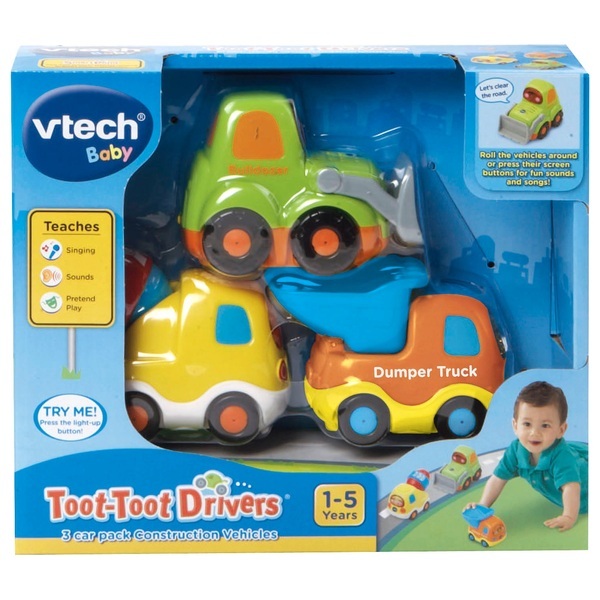 Each vehicle also interacts with other Vtech Toot-Toot Drivers Play sets for even more role-play fun. EU Warning: Please remove all packaging attachments before giving this product to a child.